Who says St. Patrick’s Day should be only shades of green? Bring the festivities to life with a vibrant rainbow of colorfully assorted fruits. 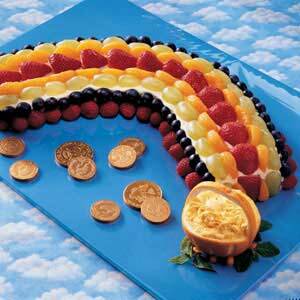 The “pot’o’gold” at the end of the rainbow is cleverly crafted from an orange. Follow the instructions to create this treat HERE.